by [Verwandte objekte] Jule Claudia Mahn. Leipzig, Germany:: verwandte objectke,, 2014.. Edition of 16. 4 volumes in foldout case. Each book 27 x 17 cm; 16 pages. Texts in English. Translation by Kevin Perryman. Set in LL Brown Thin Italic and Reclin Thin. Printed from photopolymer plates on the FAG Control 525 in the studio of Thomas Siemon (carpe plumbum) in Leipzig on Alt Burgund, 145 g/m2 handmade Römerturm paper. Pamphlet binding. Wrapper made of folded cloth. Numbered. Signed by the artist. Carol Ciavone, entropymag.org/codex-5: "Related Children is a book project about two childhoods: Mahn's and her father's. Mahn wrote her father four letters, each containing a question about his childhood growing up in Germany during WWII. While she waited for his reply, she wrote about her own childhood. 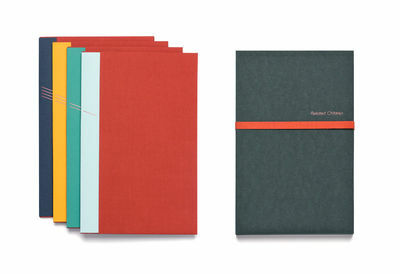 The result is 4 slim volumes in one open case, illustrated with abstract drawings printed from polymer plates. In addition to being exquisite examples of the art of bookmaking, Mahn's work is about memory, the things we cannot forget and the things we should not forget." Jule Claudia Mahn: "Related Children is the story of two childhoods, separated by fifty years of time. A book about returning to places of memories and of farewells.